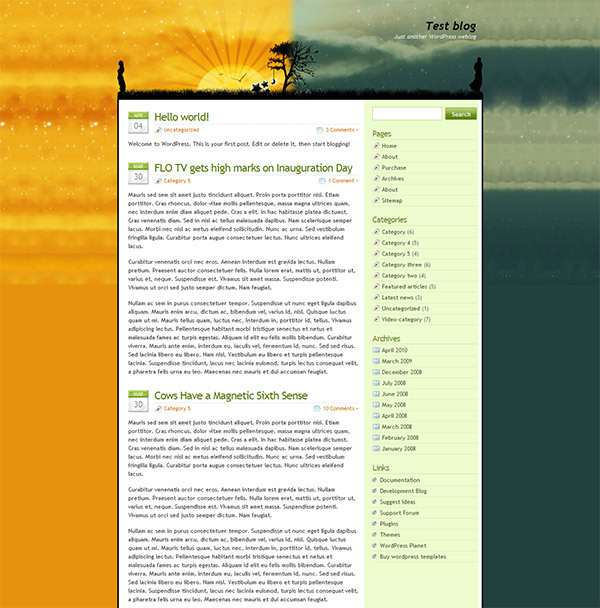 We are happy to present this inspiring theme which is sure to capture hearts and imaginations of readers of your blog. This dreamlike state of art theme is for those who start setting a special mood in their blog with its visual appearance. Download this theme if you want to show your individuality and amaze your friends. The Dreamplace theme is WordPress 3.1 compatible, Widget-ready, very user-friendly, has a built-in IE6 PNG fix, is W3C XHTML 1.0 Transitional and W3C CSS Valid, as well as fully compatible IE7, IE6, Safari 2+, Firefox 2+, Opera 9+. And the best of all is that it is completely free. Looking for something nice and cute to embellish your blog and give it a summer look? Then you are only a click away from having one, easy to use and customize. This theme is perfect for personal blogs. 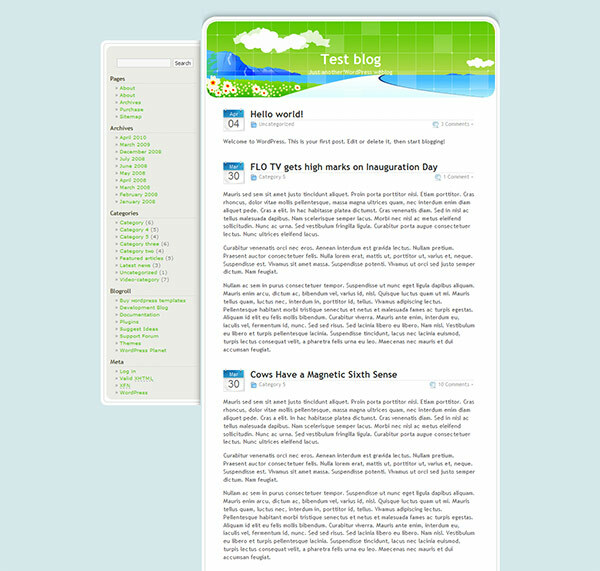 Enjoy blogging with this beautiful theme. The GreenFreshart features 2 bonus exciting and colorful preset style combinations, besides the default Green, you also get Orange and Blue color themes as options. The theme comes in English, but you can also download ready made localizations for German (DE) and Spanish (ES), so you can save yourself some time should you need translation into these. The GreenFreshart theme is WordPress 3.1 compatible, Widget-ready, very user-friendly, has a built-in IE6 PNG fix, is W3C XHTML 1.0 Transitional and W3C CSS Valid, as well as fully compatible IE7, IE6, Safari 2+, Firefox 2+, Opera 9+. And the best of all is that it is completely free. The Overload Premium Theme is a secret weapon for your online presence. This theme uses built-in scripts to avoid incompatibility with widgets and plugins and you get 6 skins with it. The custom admin interface lets you customize the theme in any way you want, no HTML knowledge is required to change skins, activate or disable elements and so on. The theme comes with a built in custom admin interface that lets you change almost everything in the theme. Enable or disable elements, change or disable content sliders and so on. No HTML knowledge is needed to customize the theme. The theme comes with two sidebar sizes. This means you can choose which one you want to use: 300 pixels wide widgets, or half sized widgets (142px wide). This let’s you customize your blog even more. It has six different color styles that can be changed through the custom admin interface. All you need to do is choose a color style and save it. 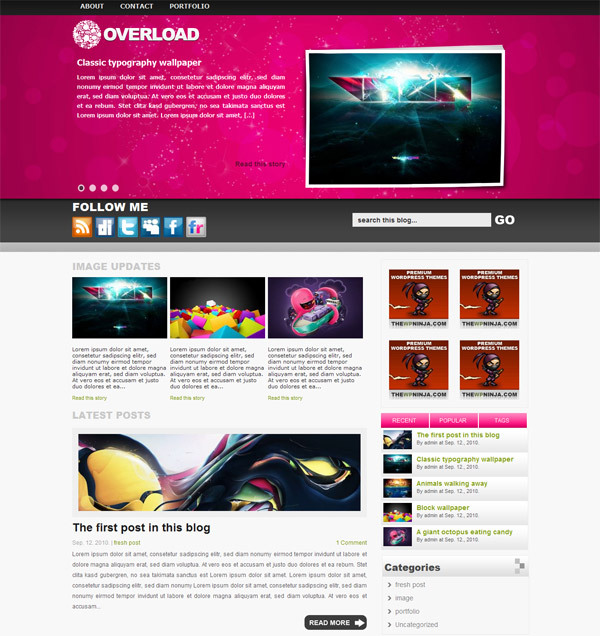 With the Overload Premium WordPress Theme you will get: A modern and unique design, 6 different skins, custom admin interface, complete installation and usage guide, built-in scripts, special script free menu, PSD logo source, single 300px wide sidebar widget space and two 140px wide sidebar widget space, built-in advertising options, content slider (can be disabled) with post listing function and a Google Analytics ready code. The theme is crossbrowser compatible and works with all recent wordpress versions up to the latest ones.